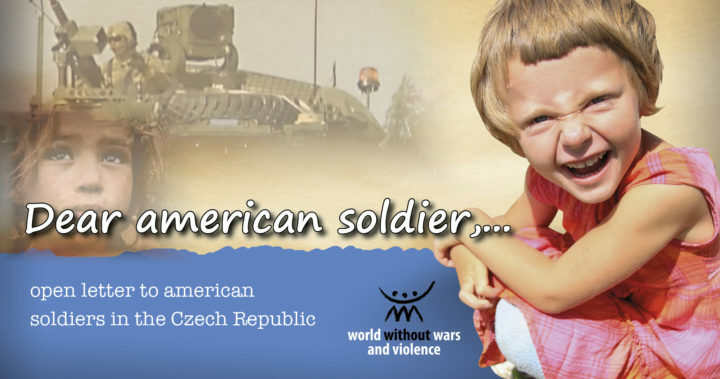 American military forces will cross the territory of the Czech Republic from May 27-30 in operation Saber Strike. The media are downplaying the event so as not to awaken the sensitivity in the Czech people that ended plans to build a US military base there in 2009. This crossing is mistakenly referred to as a “transit” but it’s really about joint US and Czech military training. The Defense Minister, Martin Stropnicky talks about a NATO exercise when it is actually a military operation of the United States’ Army in Europe (ESAREUR) culminating in training in the Baltic countries. We have delivered a letter to the American Embassy addressed to the soldiers now crossing our territory. Please feel welcome in this country, and our symbol of peace and friendship. We express our friendship and closeness given to whoever, and for whatever reason, is far from their land and from their loved ones. We also want to share with you our thoughts and our concerns about the current situation and the issues that are -certainly- the reasons why you are here in these days. We are confident, knowing the long tradition of democracy and love of freedom that inspires the highest ideals of your country, that you will be able to understand our requests. Back in March 2015, a contingent of your fellow soldiers crossed the Czech Republic, in combat vehicles, during the “Dragoon Rider” operation. On that occasion, many people came, some to welcome you, and others to protest your presence. Incredulous we witnessed the spectacle of children, who, joyfully, had the chance to see for themselves and to touch your war vehicles and equipment, which probably they had seen only in movies and video games. For many of them it was a day of celebration. One of the main reasons why our children were happy to visit your tanks and hold your combat rifles is that these children were born in times of peace. For them machine guns, missiles and tanks, only remind them of happy afternoons spent at the movies with their family and the smell of hot popcorn. And rightly so. Our children were born in times of peace, and do not know the horrors of war, they have never been terrified by the deafening noise of guns, they never had to feel the acrid smell of burning bodies and desperate cries of parents who hold the lifeless bodies of their children in their arms. Unfortunately this is the true face of war, and no one knows this better than you. And if our little ones knew as well, they would no longer be fascinated by your uniforms and your tanks, but would run and hide when you pass. Our children are born in times of peace. And it is our duty and our responsibility as parents and human beings to make sure that this peace continues. They tell us that your presence here is useful for keeping a peace that is now in danger. They tell us that we must arm ourselves and be prepared to defend ourselves from the danger of an invasion. In this logic, you would be the “good guys” who would protect us from the “bad guys.” But even this, and you know better than we do, is something that exists only in the fascinating Hollywood productions so dear to our boys. We all know that reality is much more complicated than that. We adults, know, furthermore, that the powerful weapons with which your glorious armies are equipped, were produced by someone. We know that the people who produce these weapons have an interest in creating conditions so that these weapons are sold, and to ensure that they are sold, they must be used. We also know that companies that produce and sell weapons, have enough power to influence events to make sure that they always have customers ready to buy their products. We are adult enough to understand that even companies that produce weapons do not really distinguish between “good” and “bad,” since it is from this contrast that business flourishes. I hope that you will not be offended if we say that your presence here is being used by someone to advertise their products and to stimulate their sale and, alas, their use. If it were an aftershave or a soft drink, we would not have any problem in accepting this. We live in a free market and it would be perfectly normal. However, since these are instruments of death, we are forced by circumstances to ask you politely, but firmly, to not serve this purpose, something unworthy of your mission, and contrary to the principles of your great democracy, inspired by the values of peace and freedom. We ask you to renounce, as free men, today, following the projects of factions that are illegally using their political and economic influence to exacerbate current conflicts. We ask you, as free men, to put pressure on your governments and your superiors, so that the huge resources currently devoted to weapons are converted into means and actions for diplomatic and nonviolent solutions for all the conflicts your country is directly or indirectly involved in. We are sure that you will not fall into the simple mistake of interpreting this request as a personal act of hostility against you, or against the American government and people, for which we feel a great friendship and a spontaneous sympathy. During our recent past history, we have already known intellectual censorship, in which anyone who expressed ideas unaligned to the official ones, was immediately branded as “enemy of the homeland.” So, those who were opposed to the presence in the Czech Republic of Russian tanks were accused of being pro-capitalist or American-philes. Today, paradoxically, no doubt, we will be accused of being pro-Russian, or Bolshevik, as we still say here. However, needless to say, that if your tanks sprouted Russian or German flags or even the flag from another planet, for us it would not make any difference. We are not in favour of or against any specific faction and we do not want to participate in this game of contrasts that risks plunging us quickly into the abyss of a new conflict within Europe. Like you, we love peace with all our heart, and we will use all democratic and nonviolent means to continue having it. Receive, with the hope to see you soon in our city as tourists our best regards.